Infolinx, a leading provider of records management software, is pleased to announce that they will be exhibiting at the 2018 Laserfiche Empower Conference at the Long Beach Convention Center in Long Beach, CA on January 9-12, 2018. 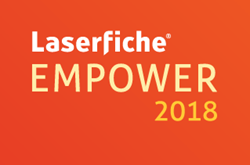 As the premiere conference and largest networking event in the Enterprise Content Management industry, Empower features more than 3,000 Laserfiche customers, resellers and employees. This year’s conference focus is to help participants ‘be a visionary, drive change and transform your office into a digital workplace’, providing opportunities for professionals who want to improve efficiency and transform their organizations. To learn more, schedule a product demonstration at Infolinx booth #19 during the show exhibit hours on January 10-12, 2018.